After watching the progress of Mistress Maymunah’s miniature cassone I decided I might try to emulate her endeavor and paint a wooden box for all my period game accessories in the same style. I looked for information on needlework and illumination patterns popular in Italy from 1400-1600 and found this GREAT article on the cassone. 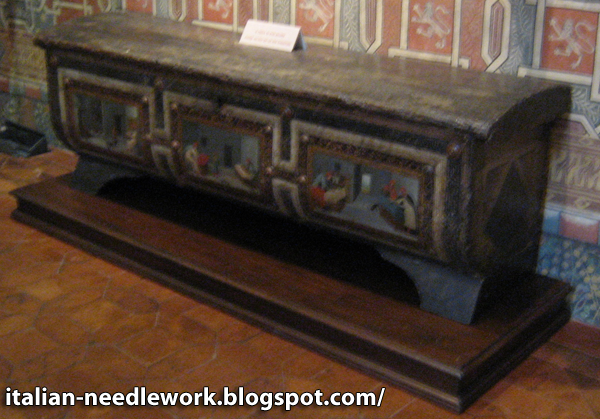 With permission from the author (Jeanine In Canada) I have posted some of it here along with a link (http://italian-needlework.blogspot.com/2011/10/italian-hope-chests-cassone.html) to the full article on her site. Enjoy! 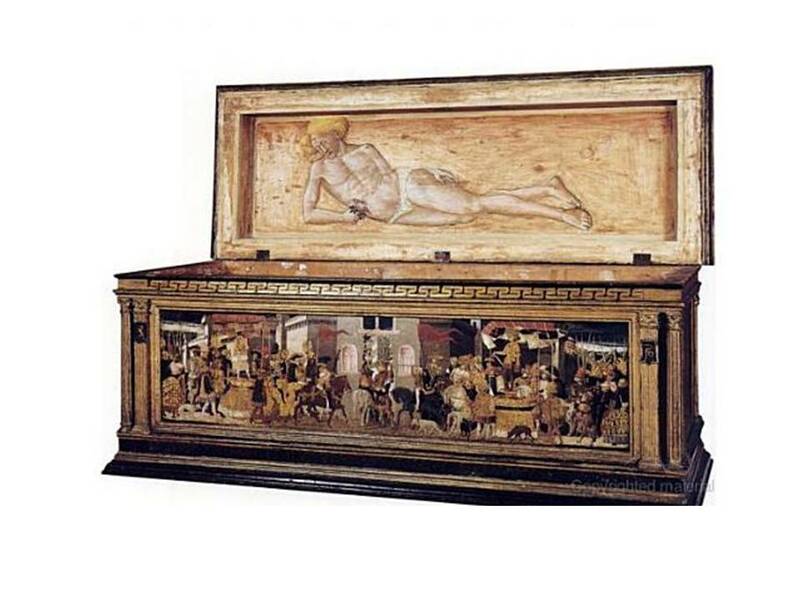 The history of the Italian cassone (marriage casket, coffer, or chest) dates back to ancient Roman times. Referred to often as forzieri before the 15th century, they often came in pairs and were a gift to the bride in which she could take her things to her new household without the personal wealth of her trousseau items being on public view. Traditionally she made a wedding procession through the streets of the city from her house to that of her groom, or in the case of foreign marriages, into the city of her betrothed as brides usually went to live in the family home of the groom. The cassoni soon became so richly ornamented that they themselves become symbols of the wealth of the bride’s trousseau and family and were considered some of the most precious pieces of household furniture. — Renaissance Textiles, Antiques Digest, 1930. Metal and velvet cassone in the Palazzo Davanzati, Florence. Italian cassoni were often richly decorated with Intarsia (inlaid wood), gilded Pastiglia (reliefs of very fine gesso), painted, carved or a combination of all these types, sometimes even having ivory carvings or bronzework. The ornamentation being so precious that the cassoni were often dismantled in later centuries so that the panels could be used as wall decorations. Many painted wooden panels in today’s museums are actually the panels of cassoni (see below – painted cassoni panels). Generally ornamented on the front and the two ends, they were sometimes decorated on the back although this side was only seen in the bride’s procession to her new home. The inside of the lid too, was often decorated, both elaborately or simply and sometimes the inventory of the cassone’s contents was written on it. The cassoni were most often lined with fabric. Early painted panels depicted notable women like Penthesilea, Hippolyta and Emilia; Dido, the warrior Camilla, the Sabine Women, Lucrezia of Rome and Verginia and other heroines from ancient history done with the idea of guiding the bride toward exemplary behaviour. Scenes and symbols representing fertility were also popular. Lorenzo de’Medici (1449 – 1492) records cassoni with ‘Petrarchan triumphs’ in his inventories signalling perhaps a move toward less morally instructive imagery. In fact, painting styles on the cassoni changed around 1440 from Gothic to Renaissance style. Gilt cassone in the Museum Collezioni Comunali d’Arte, Bologna. Sienese cassoni tended toward more romantic themes while the Florentine ones were “fiercely didactic”. In the Veneto, production was mainly in Verona and painted cassoni often had mythological stories painted on them. In the mid-15th century, Umbria and Northern Italy favoured complex scenes. Florence introduced a new style of Pastiglia at the end of the 1400s based on ancient sculpture, whereas previously Pastiglia patterns had imitated textiles or were repeating patterns. Milan favoured high-relief free-flowing foliage. By the early 16th century the overall trend was more toward lower-relief classical ornament. The mid 1500s saw change in the shape itself of the cassoni with raised lids and bulbous bases often with lion’s paws for feet. Bologna’s cassoni exhibited friezes with carved griffins, foliage and even Bucrania. While painted cassoni were popular in Florence, Venice preferred inlaid geometrical designs. In the Abruzzo, wooden cassoni were carved with sayings like: Onestà fa bella donna [Virtue makes a beautiful woman]. 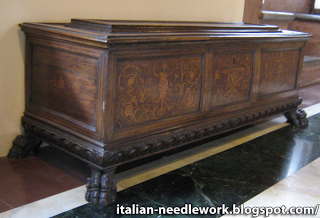 In Sardinia cassoni were traditionally carved wood, often varnished with opaque black with geometrical motifs – those which can also be found in their traditional rugs, tapestries and Filet lacework: florals, peacocks, doves, etc. Many Sardinian artisans still produce the cassoni today although in Sardinia they go by the name of cassapanca. Inputting “cassapanche sarde” into a Google search will amaze you! Famous artists of the Renaissance like Paolo Uccello (c 1397 – 1475), Pinturicchio (c 1454 – 1513), Filippino Lippi (c 1457 – 1504), Masaccio (1401 – 1428) and his brother Scheggia (1406 – 1486), Benozzo Gozzoli (c 1421 – 1497), and Sandro Botticelli (c 1444 – 1510) and many others as well as countless minor artists were commissioned to paint cassoni. Several of today’s surviving cassoni panels have been attributed to the Florentine workshop of Apollonio di Giovanni (c 1416 – 1465) which specialized in work for private citizens. During this period, Florence was well-known for exceptionally magnificent cassoni. Painted cassone in the Palazzo Davanzati, Florence. Both Cennini (c 1370 – c 1440) and Vasari (1511 – 1574) mention cassoni in their written works. Cennini gives instruction on which methods to use when painting cassoni in his Il Libro dell’Arte (1437). Vasari notes in his The Lives of the Most Excellent Italian Painters, Sculptors, and Architects (1550) that the fronts and sides of the cassoni were depicted with fables from Ovid and other authors or stories by Greek and Latin historians and even love stories, jousts and similar fair. He also notes that the two family’s co-joined heraldry was also visible at the corners and elsewhere on the chests. Vasari recounts the famous artists of the previous centuries (one artist in particular, Dello Delli c 1404 – c 1470, painted quite a number of cassoni) who were not embarrassed to paint the cassoni as were the artists of his day signalling perhaps the period when ‘professional’ quality cassoni painting was in decline. Italian cassoni were frequently made of various woods like pine, poplar and chestnut but largely of walnut. They tended to be larger than northern European and English marriage chests, ranging in size from 38 x 130 cm to 43 x 175.8 cm. Lower income families followed the tradition of the cassoni but while they were still large in size they were often unadorned. The contents of the cassoni could be anything portable the bride chose to bring with her to the marriage but mainly consisted of clothing, embroidered linens – both household and personal, toiletries, sewing and embroidery implements and materials (often whole bolts of homespun fabrics), jewelry and perhaps a few books. For more information and photos see the full original article here. 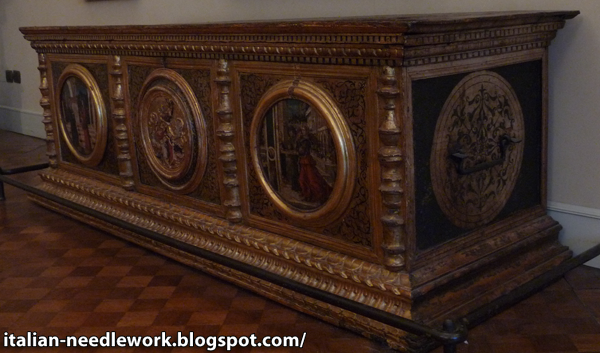 Cassone circa 1490, made in Verona, housed in Poldi Pezzoli Museum.